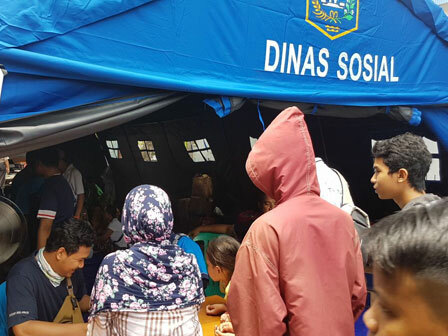 Currently tens fire victims from RW 06 and 09, Jembatan Besi, Tambora, West Jakarta are evacuating in Jakarta Social Dept. 's tents which are built on Jalan Kalianyar I, Monday (4/2).
" Based on temporary data, fire burned 17 houses at RT 01 RW 06 and 5 houses at RT 01 RW 09 last night"
Jembatan Besi Urban Village Head, Agus Mulyadi said, his side is still collecting data of fire victims between his residents. "Based on temporary data, fire burned 17 houses at RT 01 RW 06 and 5 houses at RT 01 RW 09 last night," he informed, Monday (4/2). He added, food aid has been distributed to all victims. "Allegedly, fire is caused by short circuit from one of resident houses. But we still need to wait the result of police investigation for its certainty," he conveyed. West Jakarta Fire Handling and Rescue (Gulkarmat) Sub-dept. Operation Head, Rompis Romlih explained, fire occurred on Sunday (4/1) around 9.20 PM and fire could be handled around 23.55 PM. "We deploy 23 firefighters to handle fire. One firefighter is injured while handling the fire," he stated.